FAIRFAX, VA--(Marketwire - Oct 13, 2011) - Finalists were announced today in the 8th Annual Stevie® Awards for Women in Business, the international competition recognizing the accomplishments of outstanding women executives, business owners, and the organizations they run. The Stevie Awards for Women in Business are produced by the creators of the prestigious American Business Awards and International Business Awards. The Stevies are widely considered to be the world's premier business awards. The final results of the 8th annual competition will be announced at an awards dinner at the Marriott Marquis Hotel in New York City on Friday, November 11. More than 1,300 entries -- a record for the competition -- were submitted this year by organizations and individuals around the world for consideration in 75 categories, including Best Executive, Best Entrepreneur, Women Helping Women, and Communications Campaign of the Year. Among the leading contenders with multiple Finalists are Akbank, Istanbul, Turkey; Australian Innovative Systems Pty Ltd (AIS) Company, Brisbane, Australia; Coloredge New York • Los Angeles, New York, NY; Euro RSCG Worldwide PR, New York, NY; NetApp, Sunnyvale, CA; Staff Management | SMX, Chicago, IL; Staging Diva/Six Elements Inc., Toronto, Canada; TopLine Communications, London, United Kingdom; and VerticalResponse, San Francisco, CA. For a complete list of Finalists by category, visit www.stevieawards.com/women. Finalists were chosen by business professionals worldwide during preliminary judging. 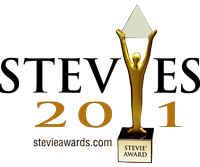 Members of six final judging committees will select Stevie Award winners from among the Finalists during final judging. A portion of each ticket sold for the November 11 awards dinner will be contributed to Camfed (www.camfed.org), which fights poverty and HIV/AIDS in Africa by educating girls and empowering women to become leaders of change. Sponsors and supporters of the 8th annual Stevie Awards for Women in Business include the Business TalkRadio Network, Coloredge, Infogroup, KeyBank | Key4Women, Melilea International Group of Companies, SDL, and Smart Reader Worldwide.